There are a few overly analytical parents like me, who in their quest to help their kids find the right college choice, are content to spend countless hours searching college ranking lists, visiting college websites, reading articles on what makes a good college and more in order to build a list of potential colleges. These parents will have no problem finding the resources they want online. Then there are the other parents, the majority, who don’t have a huge amount of time to invest (or aren’t interested in investing it), but still want to help their kids put together a list of potential colleges. What’s the answer for them? When you’re looking to buy a car, do you end up collecting information on gas mileage, warranties, and rebates? Did you visit more than three websites when buying your last TV, camera, or tablet? Have you ever bought a spreadsheet for your fantasy sports team draft–or at least seriously considered it? If you answered “yes” to any of the previous questions, be prepared to use your organizing/collecting skills as your teen starts the college search process. Long before you even get to the point of needing to track the various testing and application deadlines, you’re going to be collecting information on admission rates, test scores, and school size. And that’s not even the tip of the iceberg as far as college information goes. Those who aren’t willing to simply rely on US News College Rankings will soon discover that there’s information on gradation rates, student expenditures, and institutional aid. The problem is that most people collect this information as they find schools they are interested in rather than use it to find potential colleges. It’s really not that surprising since so many of the college search websites limit how you can actually search on the data. If I was into conspiracy theories, I would think that there are a good number of colleges that are willing to provide information only if users are limited in their ability to compare it to other institutions. We’ll tell you our graduation rates as long as users can’t compare us to all other schools. But I’m not into conspiracy theories and the fact is that there is plenty of information available for searching, sorting, and filtering with just a little looking. And I think it’s worth the effort. I’m going to give you some examples of how you can use data to start your search rather than simply collect it as part of your search using a spreadsheet that I’ve created and sell. However, I want to make sure that you understand you can do similar searches for free at CollegeResults.org or download the data yourself from the Integrated Postsecondary Education Data System. My spreadsheet’s value is convenience. Let’s start with some of the most common searches. 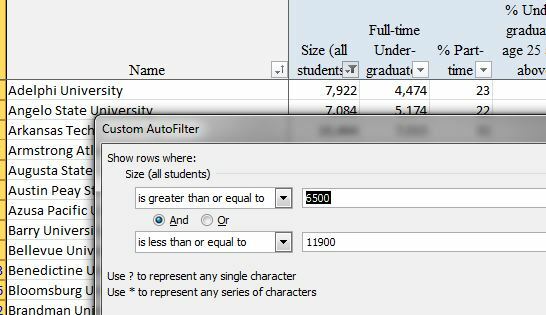 The spreadsheet contains information on 1,573 schools with 500 or more full-time undergraduates. You can search on school size without bothering with the arbitrary categories defined by so many websites. If you want just schools between 6,500 and 11,900, no problem. That’s 210 schools. 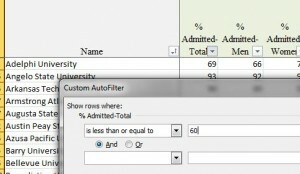 Only want to include schools that admit less than 60% of applicants? You’re down to 71 schools. Maybe you want to try to avoid taking the ACT or SAT. Then you can eliminate all schools where either test is required. That leaves you with just ten schools. Ultimately, these are some of the most common searches but not necessarily the most useful ones. By useful, I mean information that helps pay for college or makes sure you’re likely to graduate from college. Given that one of the most basic goals of attending to college would seem to be to graduate, you might be surprised at how few students actually do graduate. There are only 423 schools that have a four-year graduation rate of 50% or better. That means at over two-thirds of colleges and universities in the United States, less than half of students graduate within four years. Looking at graduation rates is one way to dramatically reduce your college search list. If you’re trying to identify schools that offer generous financial aid, you can select only schools where at least 80% of freshman are receiving institutional grants that average at least $15,000 or more. Only 179 meet both requirements. Put in a requirement for at least a 50% four-year graduation rate and you have just 129 schools. There are several factors associated with better chances of graduating. They include fewer part-time students, more full-time faculty, and more traditional undergraduates in terms of age. Indicators of likelihood of receiving merit or need-based aid from a school include information on institutional grants, non-federal student loans, average net price by family income, and 75th percentile test scores. All of this information is available on my spreadsheet. If you want to increase the number of quality schools to choose from while reducing how much you pay for tuition, start using data instead of just collecting it.